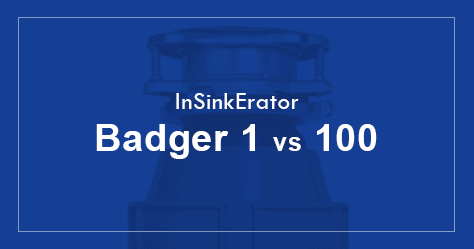 InSinkErator Badger 1 vs Badger 100 - What's the difference? What’s the difference between InSinkErator Badger 1 and Badger 100? No difference, both are exactly the same product. The only difference is their sticker one which says Badger 1 & the other Badger 100. Then why are there two products? Badger 100 is the HomeDepot version of Badger 1, you can go to a Homedepot store and buy it from the shelf but to buy a Badger 1 you need to get it online and wait for a few days for delivery. So if you are not in an urgent need of a Badger disposal buy Badger 1 online else spend 20 bucks more and get the other; yes, it costs more.